Stains created more intense colors—how can I repeat this effect deliberately? I have stumbled onto something I like and would like to know how to recreate it. I recently tie-dyed a bunch of shirts that I had considered just rags and am happy to have brought life back into them. Most of these shirts were stained. The stains appear to have taken the color better then the rest of the shirt; so stains are still visible but more vibrant if color contacted them. I like this look but would like to recreate it more so it does not look so accidental. I am not sure what the stains originally were but I think any grease type stains would make the color not want to bond so I am looking for some other staining ideas. Any ideas on how to add stains to a shirt that I can then tie dye to add another depth of color? You’re in luck. There is a convenient product, introduced just a couple of years ago, that will do exactly that. 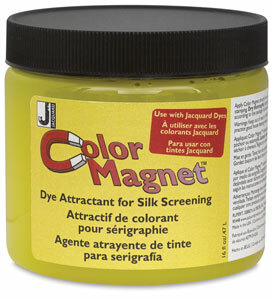 Jacquard Color Magnet can be painted, stenciled, or stamped onto fabric. It is also available in the form of a broad-tip marking pen. 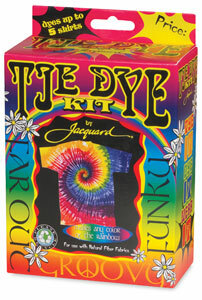 After you let it dry, you can then dye as usual with Procion MX dyes. The areas where you have applied Color Magic will show the same colors as other parts of the fabric, but much more intensely. Results are best when you dye with dilute, pale colors; you won’t see that much difference in the Color Magnet-treated areas if you are already using very intense colors. I believe that Jacquard Color Magnet is a positively charged polymer. Both the cellulose fibers in cotton, and the Procion MX dyes themselves, are negatively charged molecules. Since a large amount of any dye that you apply to fabric normally fails to attach, a positively charged formula that attracts both dye and fiber can lead to a much greater intensity of color. Here are some videos from the manufacturer, demonstrating the use of Jacquard Color Magnet…. Some of these designs could be made just as well by stamping or stenciling with fabric paint, but fabric paint always leaves at least a little bit of rough feeling on the fabric. Color Magnet does not. I’d love to see some of the results you get, when you try it. This entry was posted in dye attractant on January 21, 2015 by pburch. Thanks Paula, I’m going to try this one!